KIEV, Ukraine -- Military authorities in Ukraine believe the number of Russian troops within and close to its borders has risen to more than 50,000, raising fears of a substantial escalation in the conflict raging in Ukraine's eastern regions. Rocket attacks and peace-deal violations fuel concerns. Almost 9,000 Russian Federation Armed Forces personnel are believed to be based inside Ukraine, according to reports from the country’s National Security and Defense Council (NSDC) seen by The Independent on Sunday. The rest are based in the neighbouring Rostov region of Russia, including mechanised assault units and communications command systems. 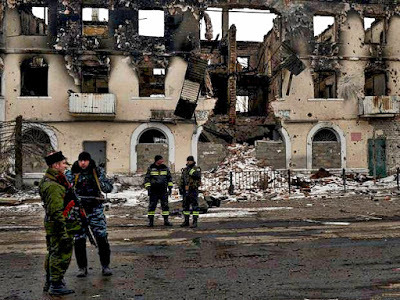 Western officials have been quick to talk of their “concern” at the rise in the number of attacks and rocket fire between Ukrainian forces and the Russian-backed separatists in recent days. Specifically, there is concern at the number of violations of a ceasefire agreement, implemented back in February after talks in Minsk, that was aimed at ending the conflict. While the levels of fighting have decreased since then, the recent surge is worrying. For example, the firing of banned “Grad” multiple-rocket launch systems restarted last Wednesday evening, with dozens of separate Grad rocket attacks recorded through to yesterday [SAT] morning. Russian-backed separatists were believed to have fired Grad rockets at residential areas of Opytne, Avdiivka, and Starohnativka on Thursday night. By Friday morning, Alexander Turchynov, the secretary of the National Security and Defence Council (NSDC), said that Ukraine might be forced to declare martial law and full mobilisation. “Ukrainian armed forces are ready to not only to repel attacks, but if necessary to counter enemy forces,” Mr Turchynov said. His words appear to have gone unheeded with 19 Grad multiple missile rockets being fired and 175 separate Minsk ceasefire violations recorded on Friday night through Saturday morning. In Opytne, one multiple rocket attack, witnessed by The IoS, resulted in five missiles struck within 20 yards of each other, creating craters 10m wide and 3m deep – and narrowly missing civilian homes. On the outskirts of the town, one civilian home had been completely destroyed by a heavy artillery shell – banned under the Minsk II agreement. A clearly distressed grandmother spoke of how her daughter and three grandchildren – aged three, seven and 11 – had been rushed to hospital by Ukrainian military forces, but remained in critical condition. The seven-year-old was suffering from serious head injuries. The grandmother, who gave her name as Natalyia, said the force of the explosion had sent her flying through a window. “I thank the Ukrainian army for acting so fast but all we want is for the war to end and for no more innocent lives to be lost,” she said. Ukrainian military intelligence reports seen by The IoS suggest that 300 Grad missile systems are based inside Ukraine – 200 with Russian-backed separatists and 100 with Russian Federation forces – including a number of rocket systems based inside the Donetsk city football stadium. The Organization for Security and Co-operation in Europe (OSCE) haves said that its monitors continued to observe ceasefire violations, including the use of heavy weapons, tanks and smaller-calibre weapons. The OSCE said that most of the violence they observed occurred in residential areas, where military positions continue to endanger civilian lives. 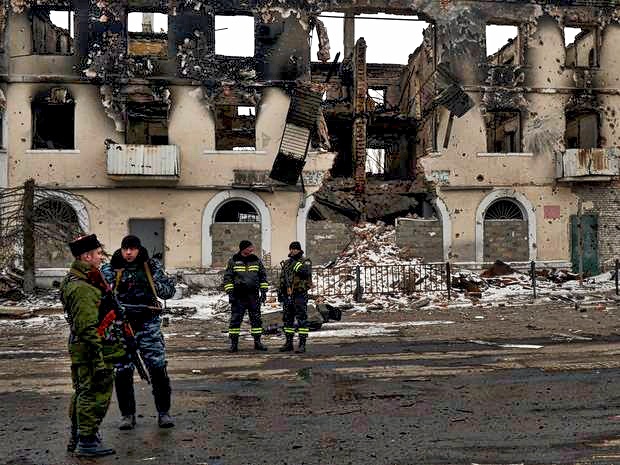 Emboldened rebel commanders have launched renewed offensives against Ukrainian towns recently. Last week, up to 400 Russian-backed separatist fighters from the so-called Donetsk People’s Republic (DNR) tried to storm Starohnativka but were repelled by Ukraine’s 72nd Brigade. With more than 130 were killed, with the Moscow-backed separatists were killed; they were described by one commander as “Russian cannon fodder”. Pushilin said that that Kiev’s implementation of the Minsk agreement had been limited, and accused Ukrainian forces of “unfortunately” violating the ceasefire with Ukraine’s armed forces by engaging in military “provocations” against separatist forces, according to news reports. As more than 6,800 people have died in the conflict since it began in April last year, and up to a million others have been displaced, fears of an escalation are significant. Michael Fallon, the UK’s Defence Secretary, made clear that he believed that the conflict was “still red-hot” on a visit to Kiev this week, saying that he could not see an end to the fighting “any time soon”. The NSDC reports set out in detail what Ukraine sees as growing Russian troop numbers, and the social media and wi-fi activity of Russian soldiers that places them inside Ukraine, including text messages and phone calls, and some analysts think that this apparent increase in personnel could have an impact on tactics for the separatists. Mark Galeotti, a professor of global affairs at the New York University School of Professional Studies, said that the evidence the NSDC had assembled suggested Russia was preparing forces it could use to launch a renewed offensive. “Even more significant than the renewed increase in Russian troops on the ground is the colonisation of the DNR and LNR [Luhansk People’s Republic] command structures by serving Russian officers from the army and security services. A Russian-armed and supported insurgency is becoming a Russian-commanded one,” said Professor Galeotti. The commander of the 93rd Mechanised Brigade, a frontline 4,500-strong Ukrainian unit, who asked not to be named to prevent reprisals against his family, said that the country was now well defended and could repel any attack. However, he made clear the potential consequences if Russian forces with Russian-backed separatists tried to further invade Ukraine – the potential result might be “World War Three”.